STRIPSTEAK is celebrity chef Michael Mina’s clever innovation of the American steakhouse. The sleek, modern décor acts as a stunning backdrop for showcasing sophisticated reinterpretations of classic favorites. Executive Chef Benjamin Jenkins translates Chef Mina’s distinctive vision with ease, infusing approachable American fare with gourmet flavors and the highest quality ingredients. STRIPSTEAK entices diners with its open-air dining room, visible from Mandalay Bay’s promenade. A glowing white plexiglass bar with Mod-style red and blue accents promises chic mingling over delectable cocktails while lounging in semi-circular swivel chairs. The lounge’s colors and geometric patterns are repeated through the rest of the restaurant to create a lively and supremely stylish environment. Large glass dividers separate intimate banquette seating from the more traditional tables that are scattered throughout the space, creating the suggestion of privacy without being closed off from the energetic activity of the dining room. In an inspired conceptual move of form following function, wood block walls visually reference chopping blocks, conforming beautifully to the modernist design scheme while subtly reminding diners of the restaurant’s main attraction: the steak. An illuminated meat locker near the open kitchen further concentrates attentions on STRIPSTEAK’s exquisite culinary offerings. Mina Group restaurants have garnered their esteemed culinary reputations by revamping traditional dishes with creative and thoughtful gourmet touches. STRIPSTEAK is no exception. Executive Chef Benjamin Jenkins transforms steakhouse classics with the flavorful integrity of fresh and seasonal ingredients, cutting edge kitchen techniques, and an haute cuisine refinement to produce dazzling dishes that are more than worthy of the Mina name. STRIPSTEAK’s Mac and Cheese, for example, is given an indulgent twist by the addition of truffles while the infusion of appetizers like Tuna Poppers and Cauliflower Soup with Asian flavors like ponzu sauce and vadouvan curry add unexpected complexities. What most distinguishes STRIPSTEAK is its unique method of meat preparation. The restaurant’s selection of Certified Angus, American Kobe, and Japanese Kobe, as well as its other meat varieties, are slow-poached in one of the kitchen’s six circulating, slow-poaching chambers for several hours before they are given a smoky finish by mesquite-stoked grills. This distinctive technique makes each cut of meat impossibly tender and succulent. Our meal begins with a trio of flavored duck fat fries and three accompanying dipping sauces. Each flavor gives the crisp, golden fries a new personality: the Smoked Paprika Fries with its associated Barbeque Sauce impart a spicy smokiness, the Truffled Fries with Truffle Aioli overwhelm the senses with a delicious pungency, and the Herbed Fries with house made Ketchup offer the simple satisfaction of a classic pairing with added herbal nuance. The trio exemplifies the STRIPSTEAK philosophy of blending approachable and traditional American comfort foods with gourmet sophistication. Satisfying and surprising, each fry is an accessibly delicious amuse bouche. The Shabu Shabu, an intriguingly uncharacteristic addition to an American steakhouse menu, does not disappoint, arriving steaming to the table. The large bowl of mushroom consommé, surrounded by little raw Kobe beef-wrapped bundles of daikon radish, enoki mushrooms and scallions, invites eager participation. Dipping a beef bundle in the consommé, we are given the control over the cooking experience, deciding how thoroughly cooked, and how mushroom-infused, we want our Kobe to be. The mushroom broth deepens the meaty flavor of the Kobe, while citrus notes and the crispness of the vegetables brighten and lighten each bite. Traditional Crab Louie gets a new, gourmet identity in STRIPSTEAK’s Lettuce Cups. Diced Dungeness crab meat and avocado nestle inside Bibb lettuce cups in clusters around a bowl of spicy sriracha vinaigrette for dipping. Crisp, creamy, and cool, the bountiful bundles are a bright and refreshing starter. The spiciness of the sriracha creeps in and emboldens the flavors of the buttery, sweet crab and avocado, awakening our palates in preparation for the rest of our meal. The Beet Salad pays homage to the pleasures and flavorful integrity of seasonal ingredients. Crowned by a tangle of fresh greens, the roasted pink, golden, and purple beets spill out on the plate, accompanied by large, tantalizing slices of soft, white burrata. The earthy sweetness of the beets predominates, punctuated by a subtle nuttiness from drizzled walnut oil. The burrata is a revelation in milky creaminess and a marked departure from lesser quality mozzarellas, contributing an added note of refreshment. The 8 Oz. American Kobe Rib Cap and Colorado Lamb arrive together to initiate our serious feasting. Strips of the Kobe are laid out simply on a steel serving pan, displaying their succulent red centers to mouthwatering effect. Tender and smoky, the Kobe epitomizes the marvels of STRIPSTEAK's distinctive steak preparation and makes us converts to this slow-poach method. The Colorado Lamb lends a distinctive Mina Mediterranean flavor to STRIPSTEAK. Large lollipops of tapenade and red pepper-rubbed lamb balance together in a teepee-like structure on the plate, exuding a delightfully heady aroma of rosemary and spices. The impossibly succulent, pink meat reflects its flavorful 12-hour slow-poach journey, permeated by the olive oil and rosemary jus it’s steeped in. The earthy brine of the tapenade accentuates the deep gameyness of the lamb that intensifies the savory satisfactions of the dish. The Truffled Mac and Cheese and Spinach Soufflé offer rich accompaniments to our meat dishes. The Mac and Cheese embodies the homey comfort of its classic inspiration, while infusing it with the luxurious pungency of truffles. The addition of broccoli crowns to the mixture offers a welcome, healthy counterpoint to the cheesy decadence. The Spinach Soufflé’s presentation, however, captivates and steals the show. It arrives as a large, green cloud to the table, that, when pierced, deflates into a delicious airy custard. Like the Truffled Mac and Cheese, it is a brilliant reinvention of an American classic: creamed spinach. Amplified by the use of a parmesan cream, that imparts a subtle but sharp hint of cheese to the dish, it is a sophisticated side that balances an ethereal lightness with enough of a creamy heft to hold up against the bold, hearty flavors of the meat dishes. To conclude, we are served STRIPSTEAK’s artful Cheesecake. Unlike the simpler presentations of our entrees, the Cheesecake has the appearance of a modernist sculpture, with the white square of cheesecake juxtaposed with orange kumquat spheres and geometric dollops of caramel sauce and Chantilly cream. The subtle sweetness of the cheesecake is permeated with the fruity tartness of the kumquat for a memorably tropical twist on this familiar dessert. Although STRIPSTEAK may be Michael Mina’s first steakhouse, he certainly has mastered the concept and made it his own, supported by Executive Chef Jenkins and his skilled team. An evening at STRIPSTEAK promises to confound expectations, balancing the simple satisfaction of quality ingredients with Mina’s own patent flair for the extraordinary. Yes, STRIPSTEAK has a private room that seats up to 40 guests for a dinner, or 50 guests for a cocktail reception. Does your restaurant have lobster on the menu? Yes, there is a lobster entree, as well as other dishes containing lobster on the menu. Chef Benjamin Jenkins is the Executive Chef at STRIPSTEAK. How many steaks are on the menu? The dinner menu offers 10 different selections of Angus and Wagyu Beef steaks, along with seafood, lamb, pork and chicken options. Yes, STRIPSTEAK offers imported and domestic caviar. Is the restaurant owned by anyone famous? 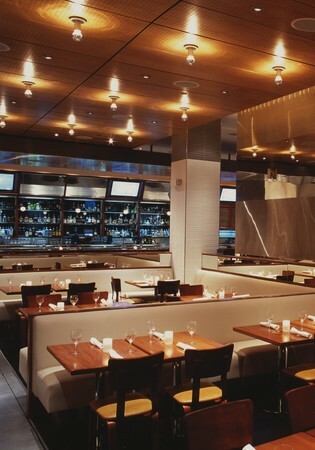 STRIPSTEAK is owned by acclaimed chef Michael Mina and the restaurant is his first steakhouse. What makes your steaks different from other steakhouses? STRIPSTEAK uses their signature slow-poaching method which enhances flavor and tenderness by heating the meat for several hours at a low temperature. The mesquite-stoked grills infuse a subtle smokiness into every steak. With reference to the coupon, what food is included in this 3 course meal? If you click on the "view menu" link under the special offer, you can view the 3 course prix fixe menu. MY GOOD FRIEND IN ST LOUIS OWNS CITIZEN KANES STEAKHOUSE BEST STEAKES I HAVE HAD TILL WE WENT TO STRIPSTEAK. PRICEY BUT GREAT. RAY FROM STL AND VEGAS. The atmosphere, food and service were outstanding. We were celebrating our anniversary and they made it very personal with decorated desserts for my wife and myself. We will definately eat there again and I have already recommended it to my family and friends. The menu is utterly to die for the service is uncomparable and the ambiance it just wonderful. You can't go wrong visting Strip Steak. My husband and I had our first experience at Stripsteak last week during our Spring Break getaway. We were absolutely impressed with the modern interior design and romantic ambiance, courteous and attentive service, but we were especially blown away by the quality of the food. We love mashed potatoes, so the three way potato puree delighted our palates; it was like mashed potatoes with three different flavors: sour cream, horseradish, and something like bacon 'n' cheese. My husband got the rib-eye medium rare, while I got the filet mignon medium rare. 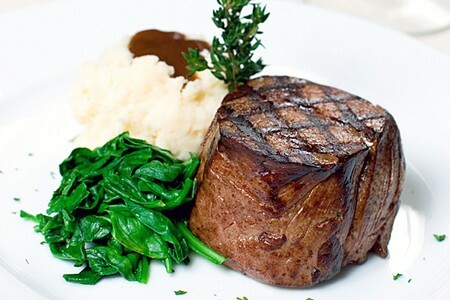 While we enjoyed both, my husband particularly favored the filet mignon because it definitely captured the wood-grilled taste and the texture was perfect; each morsel melted in our mouths. The cooked pepper and half of a scallion complimented the steaks by providing a contrast in texture. Since we didn't plan on boxing the rest for later, we were very full from cleaning off our plates. Our only regret is we didn't have enough room for dessert! Would totally eat here again, great value compared to pearl. Porterhouse was wonderful, esparagus side was a little puny in size. Waiter was amazing too, a male don't remember his name though. We was on new year eve ther. It was amazing. We had an six coure meal with very good fish and meat. It was not too much but also no too less. Go there and be enchanted. Steak, prepared in a different way, was excellent. The side dishes all had a bit of a yummy twist from the usual steakhouse sides. Staff were very knowledgeable, helpful and attentive, which made for a great all-around dining experience. A bit noisy and crowded but for Las Vegas restaurant to be expected. We were seated immediately...no wait. The atmosphere in the restaurant is great. The service was outstanding, and the food is worth every penny. Being that it was our first time at the restaurant we went off our waiters suggestions, and we couldn`t have been more impressed. The truffle mac and cheese is out of this world. 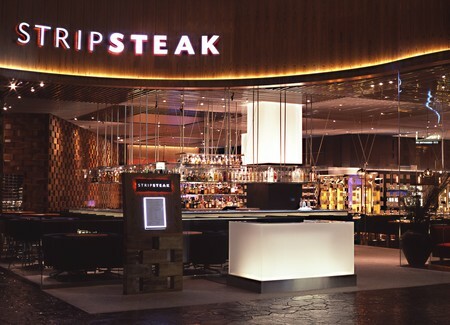 I will make stripsteak a must every time I visit Vegas!! Starting with lobster deep fried and wrapped in bacon to melt in your mouth steaks along with great sidwes made for a great dining expericence. My two daughters and myself thoroughly enjoyed our dinner at Stripsteak. We were seated promptly and quickly were greeted and given complimentary fries while we were waiting. All three of our entrees were excellent. I had the lamb,and my daughters had a steak and ahi. We shared sides of mashed potato trio, spinach souffle and a brussel sprout, bacon mix which were all delicious.We shared two desserts and a bottle of domestic champagne. I was pleasantly surprised when I received the check and felt that we had received excellent value and service for the price. I highly recommend this restaurant for an enjoyable evening. While my steak was a bit tough and lack-luster, the other steaks on the table were great, especially the filet mignon. The fries that are brought to the table as a complimentary appetizer are delicious. The crab cake appetizer wasnt worth the money. Try to stick with just the entree, or, like us, you'll be leaving a ton of food behind - and we LOVE to eat. Awesome place to try. The service is some of the best that I have experienced. Stick to ordering the steak, it had very good flavor, do not order the lobster. Great date restaurant. Meal should have been better. The food was excellent. The service was fantastic. Enjoyed the bar prior to seating. Waitress knew the menu. Service was very good, food was exceptional! Restaurant was a bit loud for romance, but everything else made up for it. Stripsteak was an overall good experience. It was enjoyable, we had good service. It isn't top of my list for ambiance and it isn't my fave but everything was nice. I was here on business and I thought the food, wine list and service were great. I only down side was the noise level, hard to hold a conversation in a normal voice. I would highly recommend Stipsteak to anyone visiting Vegas. We really enjoyed the meal at Stripsteak. The steaks were amazing and the truffled macaroni cheese was delicious. The portions are very large so we left feeling stuffed but thoroughly enjoyed it. I have been all around the country and have enjoyed many great steakhouses. My meal at stripsteak was outstanding. The dress code is a little less casual than I expected... next time I will not wear a jacket. First visit to StripSteak at Mandolay Bay. Was entertaining clients and they were very impressed with the quality of the food and the attentiveness of the wait staff. While not inexpensive, the steaks preparation was superb. Only suggestion would be to make the ambiance a little more towards "fine dining". Overall, I was pleased and so were my clients! The food and service were wonderful. There are some talented folks in the kitchen, for sure! However, the restaurant is very, very loud. We did not find that quiet conversation could be had. If you were in a large group, it would be alot of fun but for a special date night dinner, not so much. Waitstaff is excellent, food is amazing. Only thing that could be improved is atmosphere. It's definitley catered to guys. Hanging Meat is cool, but my wife was not as thrilled with it as i was. Service was great. Very attentive host without the annoyance. Informative. Good atmosphere. Wish my Japanese grade A5 Kobe was a lot better though. It had some thick fatty pieces. Overall, I did have an enjoyable experience. The wait staff and atmoshpere was fantastic. A great wine and bar selection greeted us as we were seated (on time). The Kansas City Rib Eye is definitely a must have on the menu. Our requests to be moved to a different table were not answered, If they were, we might have had a completely different experience. We were instead left to sit affront of the very busy and noisy kitchen door. When I consider that we spent over $1200 in STRIPSTEAK restaurant, entire experience was not worth the money! I dined there waiting for my show to start, and although everything was great, it took over an hour for me to get all my food. The manager came over and apologized for the delay, but there was only 4 other tables sat at that time. I had to eat my steak in less than 10 min. I was not able to enjoy it at all. Great food, high price tag, too casual? The hostess did not have my reservation on file. I received e-mail confirmation from lasvegasrestaurants.com that my 6pm reservation had indeed been received, so I was quite displeased since this was a big family outing. We were also surprised to find that the dress code was nothing like we expected (we expected more fancy: no shorts, no flip-flops, t-shirts, etc) but there were people that appeared to have just walked in from the pool. It kind of kills the ambience when you have a very fancily, modern decorated restaurant with dim lighting (which my grandparents greatly disliked because they couldn't read the menu; however that is not the restaurant's fault) and people sitting around with shorts, t-shirts and whatnot and your entire family has their "Sunday best" on. We expected a high-end restaurant with a dress code, we got a high-end restaurant with no such thing. The food is amazing, don't get me wrong; but I will know from now on to call and ask if a place has a dress code before booking, because you can't always take what a website says at face value. We had the Valentine special with the butter poached beef tenderloin & it was the most amazing steak we've ever had. INCREDIBLE! The experience would have been amazing if something had been done about the disturbing patrons. There was a group of men sitting at a table beside us that was very loud & disruptive. They were drinking, and kept screaming very loudly. We asked the waiter to let the manager know that we would appreciate if something was said, & he told us his other table had complained as well, but nothing was ever said & it just continued. This restaurant was way beyond our budget but we wanted to treat ourselves. The food was definitely worth it, but for the money we paid & the time we waited, the disturbance definitely should have been taken care of. Also, the site made it clear that we should be very well dressed, which I stressed about for weeks before our vacation. However, it clearly isn't enforced, with jeans & sloppy attire everywhere. Terrible service, the seat I sat at was two seats pushed together and I had to sit on the crease. It was my wedding night, the staff barely acknowledged it (only the busboy) and for ambience? It was like sitting in the middle of a shopping mall! The only thing above average was the price! Let me begin by telling you that my husband and I visit Vegas two to four times a year, for the last 20+ years. We adore fine dining, and I want you to know NOT to waste your money and time on this gastronomic disaster! Better to go to Olives, The Range, Ogdens, Tender, Picasso's, Prime, or a number of other fine steak houses where we have happily dropped a couple hundred dollars in exchange for a wonderful event. STRIPSTEAK restaurant will leave you wishing you had never stepped foot inside the fashionable establishment, because simply good looks are for museums ... NOT for fine dining. For starters, the seafood chowder smelled incredibly fishy the moment they put it on the table. It tasted of bacon, bacon, and un-pleasantly smelly crab. When we mentioned that we wondered how old the soup was, the waitress assured us it was fresh, and a "mgr" type stopped by the table to let us know that it was made that very day. Sure didn't taste fresh to us, and when one smells the fishy sour-ness the moment it hits the table, one would imagine that the mgr-type might just be wrong. “Foodies” know what bad fish smells like. Next came the elaborate "french fry presentation" which consisted of three metal cups of cool french fries, complete with "fancy" dipping sauces: Bar-B-Q, Catsup, and a delightful aoli-style ... oh heck, it was french fries, for goodness sake with McDonald-style dips! No matter how creatively one attempts to present french fries, the name is about as fancy as they get. They are NOT a fine dining subject to be brought out slightly cool, with nearly comedic fan-fair! Next came the main courses. My husband ordered the "upgrade" bone-in rib eye. I ordered the Prime Rib, Med Rare. What I received were two 1/2 inch slices of salty, tough, fried-edged discs slathered with salty chopped garlic between and on top. The dish was accompanied by three tiny 2" dishes of, (you won't believe this) salty, un-melted cheese-topped, MAC N CHEESE, SALTY creamed spinach topped with ... you guessed it, BACON bits, and a little coleslaw-looking cup I couldn't bare to sample. By now the "mgr" type stopped by our table again to see how we were enjoying our meal. I explained that it was not even worthy of being called "fine dining" and gestured to the tin cups of cold fries still occupying our crowded pub-style tiny table, as if to say, "Are you kidding me?". Needless to say, that was the last we saw of the "concerned" management. Yes, that was the last we saw of anyone other than the waitress with the check after I sent 90% of my terrible food back, un-eaten. Funny, but I told my husband that if they tried to comp the fiasco, I wouldn't accept it. I simply wanted them to know that the food was absolutely NOT even edible! My husband suggested that instead, if they comp the disgusting meal, we give the full amount to the waitress. We agreed on that, because surely, they couldn't expect us to pay top-dollar for salt soaked, bacon saturated food one would barely tolerate from a fast-food joint! But no one ever said another word to us. They collected the bill and tip and let us leave. WOW! DO NOT WASTE your money here! Take it from "FOODIES" who love fine dining, and happily pay for the memories gathered from each event. We even collect menus signed by chefs we especially appreciate. This waste of time and money should NEVER rate in any food critics book! And if you are a critic who condones this mess, shame on you! DO NOT ORDER THE PRIME RIB. IT WAS HORRIBLE! THE ASPARAGUS TASTED LIKE CHARCOAL, THE MAC & CHEESE WAS VERY WEIRD TASTING (ALMOST SOUR LIKE). I DON'T KNOW HOW THIS COULD BE RANKED SO HIGH IN LAS VEGAS. We had a party of ten so our bill was well over $1000.00 of which our snotty rude waitress received an automatic 18% which she deserved none of. It was clear she did not want to be there and we were inconveniencing her to expect service in a restaurant like that. I am told that is normal for Vegas. Last time I checked their unemployment was high and there should be plenty of people wanting to be there!